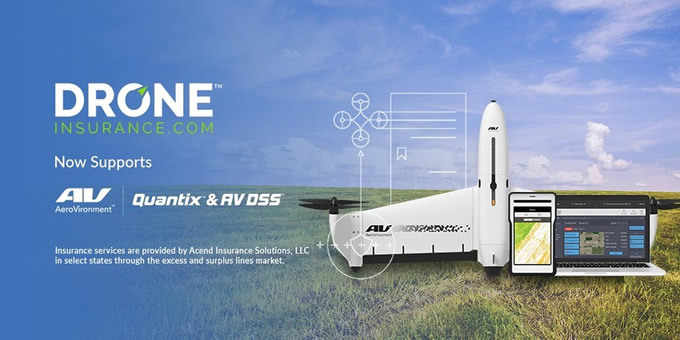 REIN's DroneInsurance.com, a digital drone insurance portal, today announced its collaboration with AeroVironment (NASDAQ : AVAV ), a global leader in unmanned aircraft systems for both defense and commercial applications, to offer insurance coverage options for the Quantix™ commercial drone platform. Quantix, together with the AeroVironment Decision Support System™ (AV DSS), provides an integrated drone and data analytics ecosystem designed specifically for precision agriculture. With one-touch mission planning and launch command, Quantix eliminates the learning curve for operators and can scout up to 400 acres in just 45 minutes, delivering actionable intelligence for today's growers. For more information visit www.avdroneanalytics.com. "The Quantix™ drone platform and AV DSS is a premium hardware and aerial data analytics solution choice for today's evolving precision agriculture and aerial mapping workflows," said REIN President & Co-founder Steve Rabbitt. "Collaborating with AeroVironment on offering dynamic coverage solutions to this enterprise-grade UAV solution will empower more commercial drone operators to not only fly with confidence, but to ensure smarter, and more strategic business decisions every time." "AeroVironment's commitment to helping growers gain insights that can improve operational efficiencies, spot crop health issues faster and improve profitability shines through with the Quantix drone and AV DSS analytics platform," said Jeff Rodrian, director of AeroVironment Commercial Information Solutions. "As the needs of our users scale and evolve alongside their operations, we are excited to work with an innovative insurance solution provider like DroneInsurance.com, whose dynamic offerings match our mission to provide the actionable intelligence our customers need to proceed with certainty." 1DroneInsurance.com is available throughout the United States except in NY, KY, IL, WV and MN. Insurance services are provided by Acend Insurance Solutions, LLC ("AIS"), a licensed surplus lines producer in all 50 U.S. States. AIS operates in California under license No. 0L70741. Additional licensing information is available at DroneInsurance.com. AeroVironment (NASDAQ : AVAV ) provides customers with more actionable intelligence so they can proceed with certainty. Based in California, AeroVironment is a global leader in unmanned aircraft systems and tactical missile systems, and serves militaries, government agencies and businesses. For more information visit www.avinc.com.